That throwaway comment encapsulates for me what seems to be badly missing in our modern, Western culture today: the conjunction of environmental awareness, love of the wild, a commitment to sustainable living, and a deep sense of the sacred. It is surprisingly rare to find them all in the same place or the same religion or the same organization. But GreenSpirit, a registered UK charity, is a group of people for whom all these things do come together. The radical vision of GreenSpirit brings together the rigour of science, the creativity of artistic expression, the passion of social action and the core wisdom that exists within the spiritual traditions of all ages. Attracting those of many faith traditions and none, GreenSpirit is a network of individuals who believe that human life has both an ecological and a spiritual dimension. Our mission, as we band together, is to explore the unfolding story of the universe and to promote common ground between people in the context of this vision. We want to balance the masculine and feminine in ourselves and in the wider culture and to befriend darkness as well as light. And we enjoy creating ceremonies and celebrations which connect us more consciously with the cycle and seasons of the Earth. People can be members of GreenSpirit and still continue to practice any other religion or spiritual discipline they feel at home in — or none. What unites us is an attitude: a particular orientation to life, to the world, and to the universe. To see the world through GreenSpirit eyes is to see everything as ecocentric (Earth-based) rather than anthropocentric (human-based). It is because our Western society and most of its institutions — including most of its religions — remain stubbornly anthropocentric, that so much has gone so badly wrong. We, as a species, have put our human needs above the overall needs of the planet. ‘GreenSpirits,’ as I call us, are people who not only love Nature but feel supported and nourished by it and have a sense of being part of a planetary whole, along with rock, river, and mountain, and all this world’s myriad life forms. We know ourselves to be cells in the body of a living being (‘Gaia,’ our Earth) and an intrinsic part of her evolutionary journey, and we aim to live our lives out of that knowing. We feel deeply connected, not just to our families and friends and not just to the dogs and cats who share our homes and the birds in our gardens, but to all living creatures everywhere on the planet, including the hidden depths of the ocean. We care deeply about what is happening in the world. GreenSpirit, as an organization, gives us a way to meet, connect, and feel less alone in whatever ‘green’ endeavors we may be engaged. It becomes a well at which we drink: a way to refresh our spirits by touching base with others who think and feel as we do. Despite the fact that members are scattered thinly around Britain, there are various opportunities for us to come together. The primary one is the annual gathering which takes place every autumn, featuring guest speakers, workshops, and opportunities to share ideas, reconnect with old friends, and make new ones. Another GreenSpirit highlight of the year, especially for city-dwellers, is ‘Wild Week,’ at the Cae Mabon retreat center in north Wales. Here, members spend time living simply and close to Nature, cooking and eating communally, walking, relaxing, swimming in the lake, playing music, meditating, learning new crafts, and deepening our feelings of connection with each other and with the Earth. Each spring there is a walking break where members and their friends, people of all ages and abilities, can spend three days together enjoying stimulating hikes in the British countryside. This was replicated in an even larger way in the summer of 2018. GreenSpirit joined forces with the Institute for Theological Partnerships at the University of Winchester to put on a Universe Story conference there. But wonderful though it is to attend these events, not everyone can find the time or the money to travel to them. This is where local groups come in. GreenSpirit has a number of them in various parts of the UK. 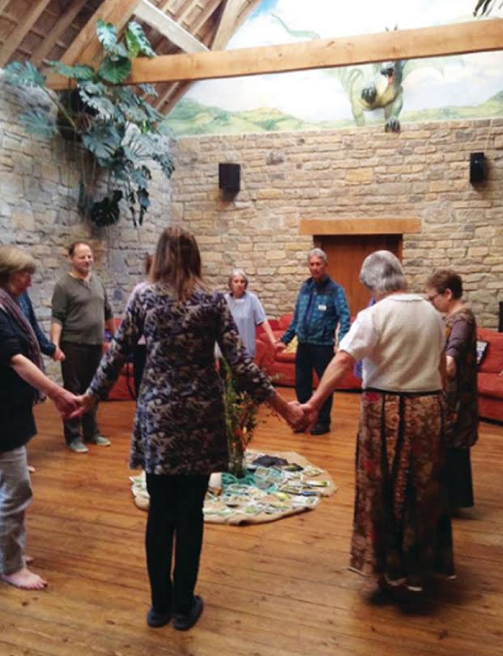 Members meet regularly to exchange ideas and do a variety of activities together such as circle dancing, listening to speakers, watching films on inspiring topics, and celebrating the turning of the seasons with song, ritual, and meditation. The public face of GreenSpirit is our website, which, as well as including sample articles from the GreenSpirit Magazine, also carries reviews of over 200 books on green and spiritual topics. From the website, you can also sign up for the free e-newsletter, which has many links to interesting events throughout the UK and elsewhere. Membership in GreenSpirit includes discounted entry into events, as well as a subscription to the GreenSpirit Magazine, which comes out three times a year in both print and electronic format. It also includes free downloads of a series of e-books (also available as low-cost paperbacks) about various aspects of green spirituality – including religious teachings about Nature – and access to a private Facebook page where members can meet and chat and share ideas and experiences online. As GreenSpirit becomes more widely known, people are starting to join from all over the world. To be an environmentalist in these times of imminent climate catastrophe can be to invite despair. When we succumb to despair, we can no longer operate effectively. But when our dedication to a life of simplicity and our activism on behalf of the Earth become not just a political stance but a spiritual journey, everything comes together. Life has a purpose. When we recognise others as fellow travellers on this same journey, we can support each other and keep each other strong.